The older couple in the middle row of this family photograph is Itzhak Herzfeld and Sure Schiff of Borysław. With them are six of their seven surviving children: Lipa, Matilda, Meilech, Usher, William and Chana, with their spouses and children. Itzhak and Sure Schiff and their family escaped the dreadful poverty they had endured in Borysław to prosperity in Canada and the United States. Among their grandchildren are counted distinguished professors of medicine and physics. 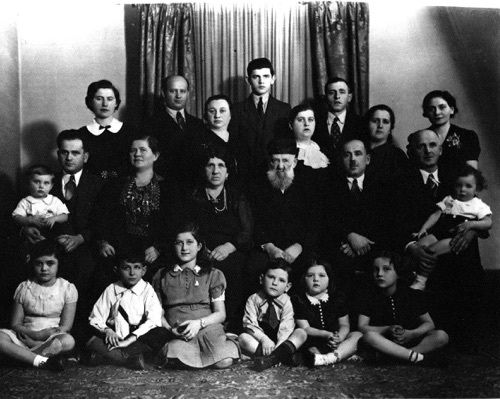 Back row left-right: Usher; Harry (Lipa’s son); Joe Katz, Chana’s husband); 3rd row: Freda (Gornitski) Gordon, (Willie ‘s wife); Rose Ambach (Usher’s wife); Chana; Masha (Meilech ‘s wife). 2nd row: Willie holding David; Mathilda (Schiff) Glaser; Sureh; Itzchak; Lipa; Meilech holding Mortimer. Front row: Elsie (Lipa’s daughter); Morris and Goldie (children of Matilda); Louis (Meilech’s son); Clara (Chana’s daughter); Shirley (Usher’s daughter). The family of Itzhak Herzfeld and his wife Sureh Schiff were, like most of the Jews in Borysław, desperately poor. Itzhak, a labourer, was born in 1858 to Gershon Herzfeld and Gitel Din. Around 1888, he married his wife, Sureh (1868-1957) the daughter of Usher (1845-1895) and Matilda Schiff, also of Borysław. 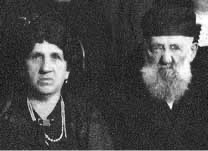 The couple lived in a one-room house with the surviving seven of their nine children: Lipa (1889-1971), Matel/Mathilda (1891-1990), Meilech (1893-1987), Gershon (1895-1901), Avrum Hersch (1897-1900), Usher (1898-1971), William/Shaye Wolf (1902-1995), Pessel Gitel (1905-1984), Chana (1907-1993). The children bore the surname of their mother since the couple did not have a civil marriage recognized by the Austrian government. Itzhak worked as a labourer. Family lore tells that he would not go to work unless his wife Sureh promised to make kreplach for him. Itzhak and his wife emigrated to Canada, arriving in Halifax on the Rundam on March 2, 1928. He died in Montreal in 1942; his wife Sureh died in 1957. Starting as an apprentice at the age of thirteen, their oldest son Lipa worked as a carpenter all his life. He was plagued by chronic bronchitis throughout his life. His day always started with about a half-hour session of lung clearing that seemed the equivalent of a day’s work. He married Genia Goldman (1890-1965) a girl from Borysław, the daughter of Berel Storch and Ronye Goldman around 1820. Lipa, an intelligent man, felt as a young man the burden of family responsibility, the obligation to support a large, growing, and poverty stricken family, Lipa never realized his true potential. He preceded his parents to Canada, arriving in Quebec in 1926. Lipa and Genia had two children, Harry, born in Borysław in 1922 and Elsie who was born in Canada in 1927. Matel (Matilda) (1891-1990), the oldest daughter, had the good sense to emigrate early. Her decision led to the sequential arrival of the rest of the family. She arrived in New York on November 27, 1912 on the Potsdam when she was twenty-one years old. She came to join a friend, Rosa Hamerman, who was already living in New York. Matilda married Charles Glaser in New York in 1925. They had two children, Goldie and Moishe (Morris). Meilech (1893-1987), a carpenter and furniture maker came to Quebec City in 1925. With his wife, Masha Levine whom he married in 1931 in Montreal, he had three children, Louis (Leib) born in 1933, Mortimer (Mottel), born in 1936, and Isaac born in 1944. Usher, who was born in Borysław in 1895, arrived in Quebec City in 1926. He worked as a plumber and then in a stationery store. He married Rose Ambach and they had two children, Shirley, (1931-1978) and Phyllis (Feyge) (1938-2002). William (Shaye Wolf) was born in 1902 in Borysław. He arrived in Haifax on the Rousillon in 1927 and worked in Toronto as a cutter. Willie also attended university. He and his wife, Freda Gornitski (Gordon) had two children, David (1936-2002) and Berl, born in 1939. Pessel Gitel (1905-1984) and Chana (1907-1993) arrived in Halifax with their parents in 1928. Chana married Yehuda Israel Katz in Montreal; they had two children, Clara born in 1933 and Evelyn, born in 1939. Submitted by Professor Harry Schiff, the grandson of Itzhak Herzfeld and Sureh Schiff.